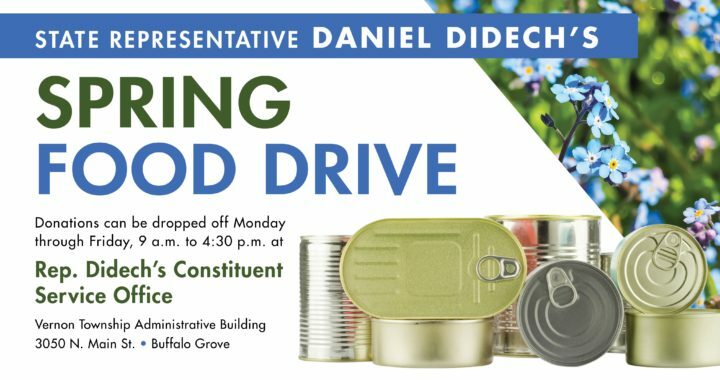 BUFFALO GROVE, Ill. – State Rep. Daniel Didech, D-Buffalo Grove, is collaborating with the Vernon Township Food Pantry to collect canned and non-perishable food donations, including Kosher food for Passover, during the Passover and Easter holiday season. Didech is collecting food drive donations until Friday, April 26 at his full-time constituent service office during regular business hours. Didech’s office is located at 3050 N. Main St. in Buffalo Grove and is open weekdays between 9 a.m. and 4:30 p.m. The food pantry is able to take donations of perishable and non-perishable items, as well as hygiene and childcare products. Didech hopes that the residents will make a donation as part of the holiday season.